People, in general, tend to have a fairly poor grasp of chemistry. I don't blame them; there's an awful lot to learn and it can get pretty complex. To make matters worse, this lack of understanding is often coupled with what some would call "chemophobia" (not a very good name, as it's not a real phobia, nor does it generally rise to the level of debilitating pathology). In short, people tend to have an inherent, emotional distrust of "chemicals" and substances that have weird, hard to pronounce names or that tend to have negative associations. For example, who wants to ingest 7,8-Dimethyl-10-[(2S,3S,4R)-2,3,4,5-tetrahydroxypentyl]benzo[g]pteridine-2,4-dione? Maybe you'd prefer C17H20N4O6? But that chemical is in a lot of foods that we eat. Many processed foods, like cereals, pastas and cheeses contain it. Don't eat processed foods and eat nothing but an all-natural, organic, "healthy" diet? You still won't avoid that chemical, since it's also in a lot of leafy greens and legumes. Both of those are the same chemical, also known as riboflavin, or vitamin B2. What about potassium? It's a metal that, when exposed to water, reacts very violently, exploding almost immediately. If you are exposed to excessive amounts of potassium, you can develop muscle paralysis and heart palpitations. And yet, it is an essential part of our diet. Your body needs potassium in order to function properly. When it comes to medical products, there is an even greater uncertainty around the ingredients. Not only do the problems above come into play, but add on distrust of faceless companies or unsavory associations, and the fear increases. I illustrated this in two of my previous posts, one on formaldehyde and one on monosodium glutamate. Some vaccines contain small amounts of these substances as a part of the manufacturing process. But there is a vaccine ingredient that gets even more bad press than either of those: aluminum (or aluminium, if you prefer). Let's take a look at this substance, how we're exposed, how our bodies deal with it, and its role in vaccines. Aluminum is a highly reactive metal that is almost never found in its pure form. Instead, it is almost always linked to other substances. It is one of the most common elements on Earth, second only to oxygen and silicon. It is in the ground, in the air (in the form of dust), in our food, and in our water. It's everywhere. We eat it, drink it, breathe it. Most people are probably most familiar with it as aluminum foil or aluminum pots. It is a rather soft metal that is easy to manipulate, doesn't corrode easily, and conducts heat pretty efficiently. Medicinally, it is most common in antacids, since it reacts readily with stomach acid to neutralize it. Concerns about how aluminum affects health arose in the 1960s and 1970s, when it was thought that there may be a link between Alzheimer's disease and exposure to large amounts of aluminum (subsequent research has largely discredited this idea among scientists, yet it persists among fringe scientists and in public opinion). Similarly, anti-vaccine activists blame the aluminum used as adjuvants in vaccines as a cause of autism. Aluminum is neurotoxic at high levels of exposure, such as among patients with renal dysfunction who are undergoing dialysis with an aluminum-containing dialysate, but it takes a lot of aluminum to cause neurological effects. Even then, its effects are not identical to the symptoms of Alzheimer's disease or autism. 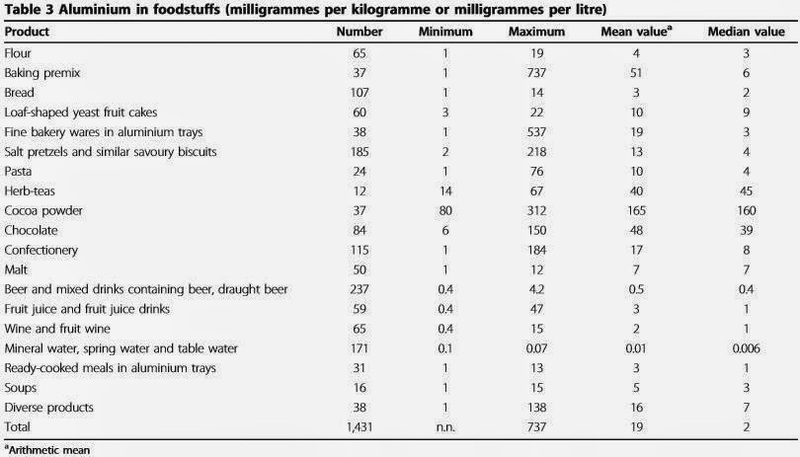 Based on the FDA’s 1993 Total Diet Study dietary exposure model and the 1987–1988 U.S. Department of Agriculture (USDA) Nationwide Food Consumption Survey, the authors estimated daily aluminum intakes of 0.10 mg Al/kg/day for 6–11-month-old infants; 0.30–0.35 mg Al/kg/day for 2–6-year-old children; 0.11 mg Al/kg/day for 10-yearold children; 0.15–0.18 mg Al/kg/day for 14–16-year-old males and females; and 0.10–0.12 mg Al/kg/day for adult (25–30- and 70+-year-old) males and females. Source: Stahl et al. (2011). We are also exposed to aluminum from some medicines, particularly antacids, which can contain 300-600 mg of aluminum hydroxide (about 104-208 mg of Al) per dose. Some anti-diarrheal drugs can have aluminum content anywhere from 36-1,450 mg per dose. And then there are some vaccines that use aluminum as an adjuvant. In the end, the total body burden of aluminum in an average person is around 30-50 mg. Humans do not appear to use aluminum for any biological function. But that's not to say that our bodies have no mechanism for dealing with it. If we didn't, humans would have died off long ago. At birth, it is estimated that infants already have a total body burden of aluminum of about 384 µg. Over the first six months or so of life, levels remain relatively stable, as the overall aluminum content of breast milk is relatively low <1% is taking up via the gut. When a child transitions to solid foods, the rate of aluminum uptake increases. Source: Mitkus et al (2011). Ingested aluminum that is not absorbed is excreted in the feces, while the portion that is absorbed enters the bloodstream and distributes throughout the body, binding with other molecules in the body, mainly in the bones and lungs. The absorbed aluminum is eventually excreted in the urine and bile. Overall, levels of aluminum in the body, under normal conditions, fluctuate up and down slightly over time, but maintain a near steady-state. People who are exposed to higher than normal levels of aluminum, such as those taking long-term antibiotics, will have higher blood and tissue levels, but they return to normal once exposure is ended (ATSDR, p.99). A small amount of aluminum can also be found in other soft tissues, including the brain. When aluminum exposure occurs via injection, about 60% of the substance is eliminated in the urine within the first day. After about five days, nearly three-quarters of the aluminum is excreted in the urine, with a small amount in the feces. The remaining aluminum is retained in the bone, lungs, kidney, spleen, liver, heart, lymph nodes and brain (in decreasing order of concentration), slowly being excreted from the body over the course of months to years. Much of the toxicity data on aluminum in humans comes from studies of workers exposed to aluminum while on the job or from patients with renal dysfunction. We also get information from numerous animal studies. Aluminum has not been observed to cause death in humans, though animal studies do provide us with an idea of how much it would take to be fatal to rodents. In mice, it takes daily ingestion of about 200 mg Al/kg/day to cause death. That would be equivalent to a human 3.2 kg newborn ingesting 640 mg of aluminum every day for days to weeks. In cases of individuals using aluminum-containing antacids (which contain 300-600 mg Al per dose) on a long-term basis, as well as among patients undergoing dialysis with an aluminum-containing dialysate, osteomalacia (aka rickets, or softening of the bones) has been observed, though this does not appear to be a problem among healthy individuals who do not have elevated aluminum exposure. As noted before, aluminum is neurotoxic at very high doses. Whereas healthy individuals can safely consume hundreds of milligrams of aluminum every day without any neurological effects, people with renal dysfunction who undergo prolonged dialysis with aluminum-containing dialysates are at risk for severe, and potentially fatal, complications. In those cases, patients develop what is called "dialysis dementia". Symptoms can include confusion, speech disorders, motor difficulties, and seizures. Dialysis dementia could also lead to coma and even death. The important thing to keep in mind about these neurological effects is that they have only been documented after prolonged, high levels of aluminum exposure in those with renal dysfunction, and primarily when it is injected intravenously, directly into the bloodstream (not orally, not inhaled, not intramuscularly, not subcutaneously). Exposure to normal, everyday levels of aluminum have not been linked to neurotoxicity. So how much aluminum is in vaccines? Why is it even used? Some vaccines only use parts of bacteria or viruses, rather than the whole thing. Because of this, large amounts of those parts are required to generate an immune response strong enough to produce immunity. That is, unless an adjuvant is used. An adjuvant is something that is added to a vaccine to boost the immune response, meaning that less of the antigens (those bits and pieces of bacteria and viruses) is required. In adjuvanted vaccines, the antigens are essentially stuck onto aluminum hydroxide or aluminum phosphate (aluminum salts). The aluminum salt serves a few primary roles. First, it gets the immune system's attention. First-responder phagocytes at the injection site will binge on some of the aluminum until they die from overeating, releasing particles that signal cell damage. The next line of phagocytes encounter all of this and are more likely to signal an inflammatory response, recruiting immune cells to find out what's going on. Second, because it is not very soluble, the aluminum salt stays put at the injections site for a while, preventing the antigens from being swept off into the bloodstream and diluted through the body. Keeping the antigens localized gives the immune system more time to investigate and get to know the antigens so that the next time you're exposed, your immune system knows what to do and how best to respond in order to keep you from getting sick. Finally, although not related to its adjuvant activity, it helps stabilize the vaccine and prevent the antigens from precipitating out of solution and sticking to the side of the container. (Sorry about anthropomorphizing the antigens, but sometimes you just have to.) Using an adjuvant like aluminum hydroxide means that less antigen is needed to produce an immune response. That means a reduction in the side effects caused by the antigen and the ability to produce more doses of vaccine without needing to increase antigen production. 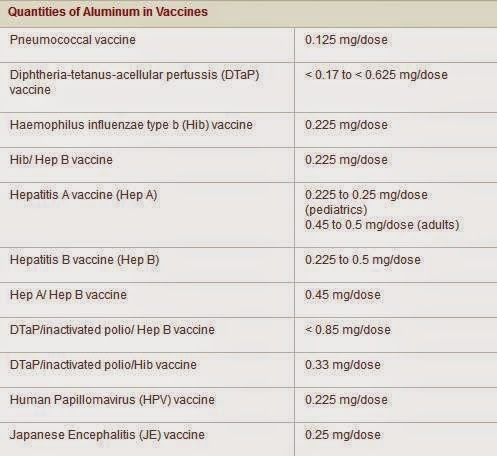 Notice that no vaccine has more than 0.85 mg of aluminum. This is because Federal regulations (21 CFR 610.15) limits the amount to no more than 0.85 mg per dose. This ensures that even those with renal dysfunction can safely receive an adjuvanted vaccine. This regulatory limit, combined with the slow dissolution of aluminum from the injection site, also ensures that the amount of aluminum received from vaccines is below the minimal risk level. While aluminum vaccine adjuvants do not cause neurological complications, they can cause local adverse reactions. The most common effect is pain and swelling at the injection site. This is generally mild and resolves quickly. In rare cases, it may also result in an allergic reaction to the aluminum and contact dermatitis. Aluminum-based adjuvants in vaccines have been in use for about 80 years, with millions upon millions of doses given. Despite so many years of safe use of these adjuvants, some people still fear them. They imagine that the tiny amounts of aluminum in some vaccines cause serious neurological side effects despite there being no scientific evidence to support that belief. As with other vaccine ingredients, the fear is out of proportion, ignoring the old adage that the dose makes the poison. At low doses, aluminum is very effective at stimulating an immune response to increase the effectiveness of vaccines. We are also exposed to, and take in, aluminum every day. We breathe it in; we drink it; we eat it. At any one time, we have around 30-50 mg of aluminum in our bodies, many times more than is found in any vaccine. At worst, we face local reactions when we get an aluminum-containing vaccine. While aluminum is an effective adjuvant with a long history of safety, it is becoming an outdated technology. As new vaccines are developed, we are going to need new adjuvants that will work with novel vaccine formulations. Viable alternatives to aluminum-based adjuvants may also go a ways toward addressing some of the fears that cause some people to forgo vaccination. But while those new methods of increasing the effectiveness of immunizations wend their way through the slow, rigorous process to approval, we need to view aluminum in vaccines as what it is: a safe and effective means of increasing the effectiveness of our vaccines. Excellent post about aluminum adjuvants used in certain childhood vaccines. The anti-vaxxers are getting desperate; there "must be something" in vaccines which triggers the onset of autism/ASDs. Perhaps I should re-title these posts something like "The Tom Lehrer Guide to Vaccine Ingredients". Whoa! Todd, your email about this blog entry was mentioned on TWIV! Props to you, they approved. Keep it up. Thank you so much for these. People get scared when they don't understand the ingredients and think it's toxic. We need to better educate people on these ingredients and the fact they are harmless. Thanks for your comment! Glad to hear this is getting out there, and hopefully it does help educate people. Thank you for all the research done here. I did find this one study that seems to be very contrary to aluminum and suggesting that perhaps we don't know everything about its affect on the human organism. Also, an infants' kidneys are not fully functioning until around a year old. Since the kidneys are the bodies main way of getting rid of aluminum does that mean infants have the metal just hanging about longer than it should be there? Francesca, the 2011 Kawahara study you link to was addressed in a 2014 study that I linked to in my post: http://www.ncbi.nlm.nih.gov/pmc/articles/PMC4131942/. As to infant kidney function, let me take another look at the literature and get back to you. An important aspect to remember is that while glomerular filtration is not fully functioning until around 12 months of age, their kidneys do operate to rid the body of various waste. After doing some more digging in the literature, it looks like the majority of aluminum is not eliminated via glomerular filtration. This suggests that while infants typically do not have fully developed glomerular filtration until around 12 months of age, that likely would not play a role in aluminum elimination. The Mitkus study I linked to in my post also discusses aluminum elimination in infants and children. Additionally, I found another study (Movsas, et al. 2013) that suggests there is no significant increase in serum aluminum among preterm infants who received around 1,200 μg of Al. The big caveats with the Movsas study, though, are that it was quite a small study (only 15 infants) and used just one measurement point following vaccination. To me, it's an interesting and suggestive study, but there really would need to be a larger follow-up study with more infants and more measurement points post-vaccination. One issue with doing a larger followup to Movsas et al. has to do with ethical approval. More serum measurements means more blood draws. Most IRBs would not approve the study unless the serum samples could be part of routine blood draws. Excessive blood draws (either in terms of volume/draw or number of draws) would put the infants at greater than minimal risk. From what I've been able to find, both while writing the original post and answering your comment, is that the evidence points to aluminum in vaccines not posing an undue risk to infants, but I'd repeat that we do need to find new non-Al adjuvants. I have seen that study and find it alarming, wouldn't we want to see elevated levels in the urine? It seems to beg the question where is the aluminium? Would love to see more studies done. And agree with you, there needs to be new adjuvants. Exactly. If it's not in the urine or blood, where did it go? Most likely in organs or bones. Funny how you have the "All Seeing Eye" as your icon. You and your article sounds fishy to me. It's the Eye of Horus. Perhaps if you bothered reading more of my posts, like this one, you might learn why I chose it as my avatar. Now, if you feel that anything in my post is inaccurate, by all means point it out and provide your evidence. Unlike the majority of anti-vaccine folks I've encountered, I'm willing to admit my mistakes and make corrections where they are warranted. Can you tell me where you got the 60% figure from for injection of vaccines? There's injecting intravenously, intramuscular, and ingestion. I'd like a citation for the intramuscular injection. Been a while since I wrote this, so I don't quite remember. However, I believe it was from the ATSDR document on aluminum. I only see info from intravenous injection. The Mitkus paper you cited also used intravenous and ingestion to calculate aluminum retention in section 2.3. The ATSDR document does discuss intramuscular and subcutaneous routes of administration, as well. The Mitkus paper also modeled Al elimination using intramuscular data. The Mitkus paper uses equations 1-7 to model Al elimination from vaccines. Equations 1-7 are from intravenous data, not intramuscular so I don't think that is appropriate since vaccines are intramuscular injected. If I am mistaken, can you point out precisely where in the paper he used intramuscular data? Mitkus et al. write that the Priest calculations were based on IV administration and that IM administration is unlikely to result in immediate uptake into the bloodstrem. They repeated their analysis based on a study from Flarend et al. that examined IM uptake. I apologize but I am not sure what you're trying to say. First, are you admitting that Mitkus used intravascular (IV) for calculations rather than intramuscular (IM)? Second, the Flarend study you mentioned from 1997 stated that only 6% of aluminum hydroxide was eliminated and 22% of aluminum phosphate was eliminated after 28 days. That means most of the aluminum was not eliminated. So the question is, like in the Movsas study, where did the aluminum go? Sorry for the delay in response. "Real life" and all that. Also, I wanted to give Mitkus another quick read before responding. The intravenous elimination rates are pertinent. Here's what Mitkus et al. describe. When an Al-adjuvanted vaccine is administered, the aluminum adjuvant is in an insoluble form, so it stays at the site of injection. Gradually, the interstitial fluid solubilizes the adjuvant, allowing it to get away from the injection site and taken up into the bloodstream. That's where the IV data comes into play. So, Mitkus et al. modeled a slow release of aluminum from the injection site (~51% for aluminum phosphate, ~17% for aluminum hydroxide in the first 28 days), after which it follows the pharmacokinetics for an intravenous bolus: majority eliminated in the urine, some residues deposited in bone and organs, as discussed in the ATSDR document. From a paper by Gherardi, it doesn't stay at the site of injection. It talked about CCL2 dependent translocation and that the florescent latex beads injected into tail vein had almost no cerebral entry compared to intramuscular. Doesn't this show that macrophages can carry the aluminum to various organs? To elaborate, according to that study and a study by Krewski, reticuloendothelial cells can take up aluminum in the form from vaccines and deposit them in various tissues of organs rather than the aluminum being eventually filtered out by kidneys. Krewski study differentiated aluminum citrate and other forms. Since Mitkus referred to aluminum citrate rather than the forms of aluminum in vaccines, isn't the Mitkus study just assuming that aluminum adjuvants behave the same way that aluminum citrate does, which is shown to be wrong by Krewski? Can you provide links to the Gherardi and Krewski papers? I'll give them a read, but my day's looking quite busy, so apologies for any delay in responding. In short, Krewski et al. appears to support the conclusion that aluminum in vaccines does not pose any significant risk beyond local irritation/itchiness and rarely Al sensitization. Todd, have you read the Gherardi paper yet? I want to respond to both at the same time rather than have two separate discussions. I cited Krewski solely to bring up the point for aluminum citrate. In case anyone thinks I'm contradicting myself, I make it clear I do not agree 100% with every paper I cite. There were limitations to Krewski's paper in regards to the IM route that Gherardi addressed, which is why I brought it up. I also give significantly less weight to the authors' interpretation of data relative to the actual data. Gherardi used poly IC to stimulate the immune system which mimics the immune response to weakened viruses in vaccines and to aluminum. He found that after a year, the aluminum ended up in the brain. From the site of injection, there were granules but also macrophages took the aluminum through the lymphatic system, to the bloodstream to the spleen and eventually to the brain due to cytokine signaling. IM injection without immune system simulation will just form granules with little movement to the brain but with immune activation, signaling molecules were shown to direct aluminum to the brain. Vaccines by definition its purpose is to get an immune response and aluminum is used to activate the immune response so Gherardi's experiment with poly IC which mimics dsRNA is appropriate. Gherardi mentioned that the people especially vulnerable isn't necessarily due to genetics, but also overimmunization, immature blood brain barrier, etc. which can affect everyone. As people age, genes that produce CCL2 is upregulated. Fetuses and newborns have immature blood brain barrier, couple that with pregnant mothers being recommended aluminum containing vaccines and vaccine recommendations continuing to increase for infants. Since aluminum can move around when there is immune activation, how do we know it can't utilize the placenta to get into the developing fetus? Sorry the poly IC was from other experiments to induce neuro inflammation and up regulation of CCL2. Gherardi didn't mention poly IC but used mice with high CCL2 production to begin with so the poly IC wasn't necessary. My point about the immune activation and immature blood brain barrier still holds. This was just a technical error. The Gherardi paper had several big flaws for me. First, they used the equivalent of 4.3-6.8 times the normal dose that a human would receive. That is a huge difference in acute aluminum exposure, so from the start, they're already setting the experiment up to detect increased levels of Al in the brain. I'm not certain about the conversion they used to get to those amounts, but perhaps Science Mom might be able to weigh in. Second, it's not clear to me whether the addition of rhodamine to create the Al-Rho particles would affect how the cells interact with them. They did note that the particles varied in size and shape, which could alter how they are taken up. Third, it's not clear how analogous the fluorescent latex beads are to Al(OH)3. Their main conclusion seems to be largely based on the FLB experiments. They used FLBs because they are easy to detect, but I didn't see anything in the paper indicating that they interact in the same manner as aluminum adjuvants. Fourth, in the x-ray experiments to detect presence of Al, it was not clear how they were able to differentiate the detected Al as being from the injections vs. other sources (e.g., manufactured food, water, inhalation, etc.). Fifth, Gherardi et al. didn't include an analysis of how much of the injected Al was found in the various locations (injection site, bone, kidneys, liver, spleen, brain, urine, stool, etc.). It didn't look like they did a quantitative analysis to determine how much is distributed to which organs, how long it took for the Al to migrate from one location to another, and so on. Sixth, as Science Mom noted below, they used genetically impaired mice. Combined with the fact that they used grossly increased doses of Al, this further stacks the deck in favor of their hypothesis. How generalizable is this to the general population? One question I had was whether any of the mice may have also had any sort of renal impairment, but I did find that they used mouse breeds that tend to be resistant to renal injury. However, they did not mention any tests to ensure there was no renal impairment, which could also skew the results in their favor. Finally, they did not note any clinically significant results, such as developmental impairment, even among the mice genetically predisposed to suspected increased brain infiltration. I do note that they conclude that aluminum is excellently tolerated among wild-type mice, even at the vastly increased acute doses they used. Among the genetically susceptible (leaky BBB and elevated CCL2 mice), they speculate that it could be harmful, but they could not conclude that the Al had any negative impact. The bottom line, after reading it, is that among those who are exposed intramuscularly to much higher levels of Al than in vaccines and who have a leaky BBB or elevated CCL2, there might be increased accumulation of Al in the brain at a relatively low rate among the overall population, but that there is no evidence that such accumulation results in any clinically significant impairment or harm. At best, the Gherardi paper suggests that we might want to look for biomarkers for leaky BBB/increased CCL2, and that among those who have those markers, we might want to consider Al-free vaccines or spacing out the administration by some amount of time. In adopting such a policy, however, we would need to weigh the cost of developing such tests, the costs (and risks) of administering those tests to every vaccine recipient, whether the tests would need to be repeated due to changes as we age or suffer diseases or injuries that may change those markers, whether such screening would would result in significant improvements in clinical outcomes, and the effects of delaying/spacing out vaccination on disease susceptibility and the risk of an outbreak. I think the conclusion to my post bears repeating: evidence points to aluminum being a safe and effective means of improving the effectiveness of our vaccines. But, it is becoming an outdated tool. We need to develop new ways of achieving similar results, mostly due to changing technology in how our vaccines are made, but also to eliminate the unfounded fears among the anti-vaccine set. I think you misinterpreted the aluminum doses. It is not 4.3 to 6.8 times the normal dose a human would receive. The 4.3 to 6.8 would be the mean number of doses received by a patient. You were concerned how the materials were analogous to Al (OH) 3 but this is irrelevant. We should be looking at the aluminum nanoparticles conjugated to antigens, not the adjuvants themselves. As I mentioned, the adjuvants undergo ligand exchange to bind the antigen and provoke an immune response by inducing a series of phagocytosis, aluminum destruction of cell, repeat. This is not controversial as this is the point of adjuvants to begin with. Al-Rho was used because it formed microscopic agglomerates the way aluminum nanoparticles that are conjugated to antigens in vaccines do. They're supposed to vary in size and shape as this is what happens with vaccine aluminum. FLBs were used because they are avidly phagocytosed as aluminum in vaccines when conjugated to antigens are. For your fourth point, we already know that 99% of aluminum ingested is filtered out by the kidneys and the controls were exposed to the same conditions, yeah? For your fifth point, that's not necessarily a "flaw". Sure, it would be nice to quantify aluminum in each organ but regardless of whether or not they did this doesn't make the study wrong. As for the genetically impaired mice, I addressed that in the above post. It was to mimic maternal immune activation or immune activation in general as this is what vaccines purports to do. Again it is not just genetically susceptible individuals. We also need to look at upregulation and down regulation of genes. Interleukin 6, CCL2 is up regulated when there is immune activation. Vaccines, the purpose is immune activation. And aluminum, it is to destroy the phagocyte and reexpose the antigen so that more immune cells and macrophages show up. This is how the immune system is stimulated and why aluminum is used in the first place so nothing controversial here. Yes, there are genetically susceptible individuals with high CCL2 production, but immune activation in anyone also causes the CCL2 gene to express more. As for renal injury, is it wrong to trust their source of lab mice and they should've done their own studies to prove that the mice breeds are really resistant to renal injury? As for the mice with impaired blood brain barrier, this was to mimic fetuses and newborns. Aluminum in the wild type is well tolerated but newborns have immature blood brain barriers and people given vaccines will have immune activation so I don't see how that is relevant. They did not conclude that aluminum is harmful in the brain because this is not what they set out to prove. The study was to show that aluminum can end up in the brain significantly more when there is immune activation and immature blood brain barrier. To conclude that aluminum is harmful in the brain is something that takes long terms studies to do and there are many studies in the literature linking aluminum to being a neurotoxin. I think to use the word "flaw" for this is misleading. They accomplished what they purported to do. I don't think I'm misreading the bit about the doses. The mice were given a single dose of aluminum equivalent to cumulative of 4.3-6.8 doses (average being around 5.2-5.5 doses). So they're using a larger acute dose where a human would get smaller doses spread out over time (meaning there would be more elimination and less accumulation in humans as compared to the mice). How analogous the FLBs and Al-Rho are to Al(OH)3 actually is important. If the body handles them differently than the adjuvant, that would have an impact on how applicable this study is to Al-adjuvanted vaccines. As for my point #4, most ingested aluminum isn't even absorbed, but my main point is that while they did take efforts to minimize other sources of aluminum, the x-ray results still need to be taken with a grain of salt, because they are not able to differentiate between aluminum from the injection and Al from other sources. The genetic impairment point still stands, along with the corresponding question about screening. The lack of testing for renal insufficiency is more of a quibble on my part. Not crucial, but would strengthen their study. The reason I brought up the lack of clinical outcomes was not so much a flaw as just pointing out that this study can't be used to make any conclusions as to whether or not aluminum in vaccines is harmful. Why is the equivalence of Al-Rho and FLBs to Al (OH) 3 important? What's important is their equivalence to the form AFTER Al (OH) 3 undergoes ligand exchange with the antigen. When Al (OH) 3 binds with antigen, it is no longer Al (OH) 3 so I don't understand why you think it's important to be equivalent to Al (OH) 3. It's the Al conjugated to the antigen that matters. Al-Rho and FLBs are handled the way Al nanoparticles are handled which is what's relevant. If most ingested aluminum isn't even absorbed, how will that affect the study? What other sources of aluminum would interfere with the data? You said the point on genetic impairment still stands. I pointed out that the genetic impairment was done to be analogous to immune activation and immature blood brain barrier. What is your counter argument for that? As I said, abnormal genes aren't the only thing that matters but also inducing normal genes (up and down regulation) to produce more CCL2. I know most biochemistry or biology courses don't go into promoters, inducing agents, ribosome binding site affinity, or alternative splicing. Most people actually still think introns are junk DNA. Just curious, what background in science (both formal and informal training) do you have? I'm not using this to launch an ad hominem attack. I'm just curious. About the doses, the study showed that aluminum persisted in the brain and there were no signs of elimination. In fact, there was more in day 90 than in day 21. In another case, the amount after 365 days was the same as the amount after 21 days so no elimination. This shows injecting all at once or spreading out the injection shouldn't make a difference. In addition, we know that even in small doses spread over time, immune system is activated as this is what vaccines purport to do. If macrophages aren't recruited, the vaccine failed and there would be no point to begin with. Also, 4-6 doses are given easily in vaccines to infants. They aren't that spread out either. One dose from the paper was 0.5 mg of aluminum. By 18 months, if infants get all their recommended vaccines it would be a bit less than 5 mg of aluminum. The rats were given 4-6 doses which is about 3 mg. They overdosed the mice. Not only did they dose the mice with several mg/kg more aluminium than the human equivalent (based upon the FDA guidance they claimed to have used) but they used the mean weight of the mice at 180 days to justify larger doses. You were concerned how the materials were analogous to Al (OH) 3 but this is irrelevant. We should be looking at the aluminum nanoparticles conjugated to antigens, not the adjuvants themselves. It is hardly irrelevant when they used antigens which don't reflect real world application. They could have used the same antigens and simply attached an aluminium tracer such as Flarend et al. and Priest et al. did. Not only that, adjuvants used aren't nanoparticles, they're microparticles. Nanoparticle adjuvants are experimental. So again, Gherardi et al. is stacking the deck in their favour and diminishing the external validity of their study in doing so. As for the genetically impaired mice, I addressed that in the above post. It was to mimic maternal immune activation or immune activation in general as this is what vaccines purports to do. Again it is not just genetically susceptible individuals. No it wasn't. Gherardi is basing this hypothesis on the non-existent ASIA syndrome in adults. Nothing is mentioned about foetal development. Furthermore, the genetically altered mice with a leaky BBB in no way resemble infant BBB. They accomplished what they purported to do. Which was what exactly? Their hypothesis doesn't match the methods nor even what you claim. They didn't use animal models, antigen-adjuvant complexes that are used nor dosages and didn't find any clinically-relevant alterations. This study isn't remotely generalisable to the human population (or even most animals) as I already stated and looks more like playtime with shiny new instruments and some post-docs. But no doubt their benefactress Claire Dwoskin is pleased with some sciency stuff she can't even begin to understand. I addressed the dosage in the post after which you commented on. Can you comment on that? Neither Flarend nor Priest used antigens. Also if you refer Al (OH) 3 to an adjuvant, then they are nanoparticles. These are small molecules. Only after conjugation to antigens are they big enough to be considered microparticles. Todd mentioned above that whatever is used should be equivalent to Al (OH) 3 but both you and I agree that it is the Al with the antigen that matters, yeah? With that said, Gherardi justified that Al-Rho and FLBs behave the same way as the aluminum bonded to antigen. While using antigen, Al and tracer is ideal, if Al-Rho and others are equivalent, what is the problem? Can you debunk the reasons Gherardi used to justify using Al-Rho and FLBs? While not explicitly stated, from Paul Patterson's rat and monkey experiments with poly IC we know that maternal immune activation can occur. It's also not controversial that vaccines stimulate the immune response so whatever study you cite to defend aluminum must involve immune activation. Gherardi did but Flarend and Priest didn't unless we are talking about different Flarend and Priest papers. Please post links to those two papers. What is the difference between leaky BBB in genetically altered mice and infant BBB? Can you elaborate on this point? Let's do some maths shall we? And also some background on Gherardi's justification of methods. First, the mice he used are only 24-26g (mean 19-20g) at 8-10 weeks respectively and when they were innoculated, not 35g. Using the 100ug/kg conversion he used and a mean of 5.2 alum-containing vaccines*, that would only be 12.5-13.5 ug Al (and that's on the high side) the mice should have been injected with, not 18 ug. Most were females (69%) and were at the middle age at time of biopsy (median 45 years, range 17-­‐74). They had received 1 to 17 i.m. 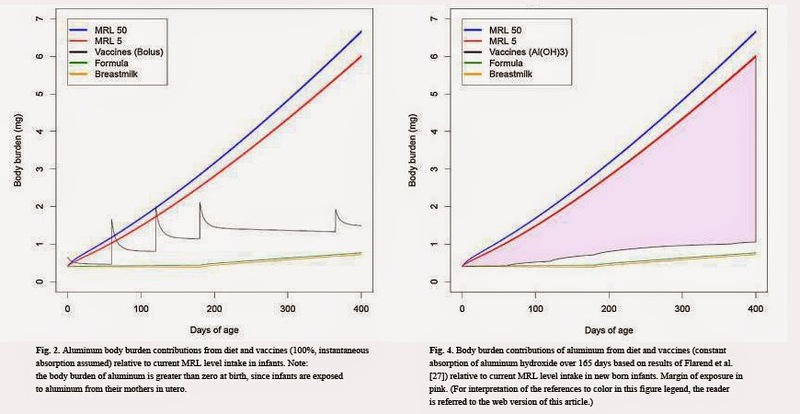 alum-­‐containin vaccine administrations (mean 5.2) in the 10 years before MMF detection. First, the vaccines were not confirmed; next, there are simply not that many vaccines that are recommended on the French schedule (not even the U.S. schedule) and not all of those would be alum-containing vaccines. So even the estimate of 5.2 mean doses is overblown. Finally, did you notice the part that stated the vaccines were received in the previous 10 years? Why did Gherardi administer a single bolus dose? None of what he did mimics the conditions he claims are in the "MMF' patients. Correct, however their methods were far more contributory to the literature than Gherardi's drek. Also if you refer Al (OH) 3 to an adjuvant, then they are nanoparticles. 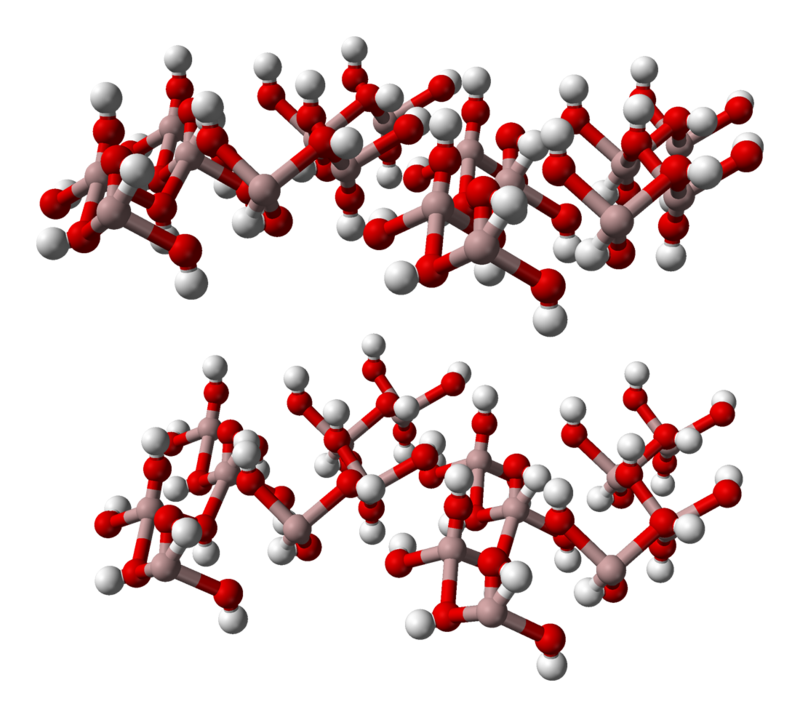 These are small molecules. Only after conjugation to antigens are they big enough to be considered microparticles. Pure rubbish. All currently used Al adjuvants are microparticles. Again, nanoparticles are experimental right now. With that said, Gherardi justified that Al-Rho and FLBs behave the same way as the aluminum bonded to antigen. While using antigen, Al and tracer is ideal, if Al-Rho and others are equivalent, what is the problem? Can you debunk the reasons Gherardi used to justify using Al-Rho and FLBs? Rhodium and FLBs are not antigens; they are tracers. Read the paper again. But could certainly cause altered uptake and distribution that don't resemble antigen-adjuvant complexes so it isn't comparable by your own metric (per your dismissal of Flarend and Priest). While not explicitly stated, from Paul Patterson's rat and monkey experiments with poly IC we know that maternal immune activation can occur. It's also not controversial that vaccines stimulate the immune response so whatever study you cite to defend aluminum must involve immune activation. It is highly disingenous of you to claim that Gherardi's hypothesis involved foetuses and infants when it clearly didn't and then invoke this. It's a strawman. Infants don't have "leaky BBB" as a matter of course unless there is a genetic defect or altered physiology (any are rare). There are numerous texts and papers on infant BBB you can avail yourself of as I can't do it justice in a comment box. Gherardi's work again is sloppy, stacked and doesn't show any evidence of clinical relevance even by the authors' own admission. There was also a curious omission in the results for post day 21 which they had data for. Bottom line is this doesn't support his claims because ASIA doesn't exist and MMF as he describes doesn't exist. Part 1/2 I never claimed Gherardi used that amount of aluminum to mimic MMF. If you read my above post, I was saying that the amount of aluminum used would correspond to infants. See what I wrote about the 18 months. And I justified the one dose for them. Gherardi did mention the part on MMF but this isn't the argument I'm making. I'm making the argument that the amount used is less than what is received by babies up to 18 months of age. You wrote: " Correct, however their methods were far more contributory to the literature than Gherardi's drek." This is a red herring. Just because their methods are "far more contributary" in literature doesn't mean it's correct. Again, you haven't addressed what I said about immune activation. Also let's not use insults and name calling in these discussions. Al (OH) 3 is on the nanoscale. It's only 7 atoms big. It's basic chemistry. Therefore it is a nanoparticle. An antigen is a microparticle. Adjuvant plus antigen is a mocroparticle. But Al (OH) 3 is a nanoparticle. If you continue to argue that Al (OH) 3 is a microparticle, tell me its length in microns. It is less than 1 micron. So nano is more appropriate than micro. You said "Rhodium and FLBs are not antigens; they are tracers. Read the paper again. But could certainly cause altered uptake and distribution that don't resemble antigen-adjuvant complexes so it isn't comparable by your own metric (per your dismissal of Flarend and Priest)." I never advanced the argument that rhodium and FLBs were antigens. I only said they behaved like them. And I justified how they behaved like them in the above post and Gherardi justified using them in his paper. On the other hand, it's obvious antigen-adjuvant complex isn't equivalent to adjuvant alone. So this is not a one to one comparison. I will accept Flarend and Priest papers if you justify to me that antigen-adjuvant is equivalent to adjuvant. Gherardi gave a justification for Al-Rho and FLBs which you still haven't debunked. Gherardi backed up his claim. You however, just stated that they're not comparable and have no justification so you just made a groundless statement. You said: "It is highly disingenous of you to claim that Gherardi's hypothesis involved foetuses and infants when it clearly didn't and then invoke this. It's a strawman." We are here to discuss whether or not aluminum can enter the brain of infants or fetuses. The discussion is not just limited to what Gherardi said. Gherardi was something I brought up for this topic. The topic is whether or not aluminum can be dangerous. The topic is not about what Gherardi said and what he didn't say. Why can't I invoke something that is relevant? And you keep dodging my points about maternal immune activation without addressing them. Regardless of whether or not Gherardi brought up immune activation, it doesn't change the fact that it exists. And Gherardi did mention that immature blood brain barrier and over immunization may play a role. Also, while Gherardi didn't mention overexpression of CCL2 in the epigenetic sense, I did. Is my point invalid because Gherardi didn't say so? Regardless of whether or not Gherardi talked about it doesn't change the fact that CCL2 expression level can increase from immune activation. I brought up Patterson to justify this. Am I not allowed to do this? The topic isn't solely on Gherardi as we talked about Mitkus, Flarend and others too. You said "Infants don't have "leaky BBB" as a matter of course unless there is a genetic defect or altered physiology (any are rare)." This is a strawman. I never advanced the argument that infants had leaky BBB. I said infants had immature blood brain barrier and the genetically engineered mice had leaky BBB to mimic this. I'm not going to scroll up and reread what I typed but I'm sure I didn't mention they had leaky BBB. If I did, I meant immature BBB. Anyways, I want to focus on the Priest and Flarend papers. I want to repeat this to emphasize so we don't go off track on technicalities and trivial arguments too much. Why are they relevant if there is no immune activation? The only justification you gave was that they were "far more contributory to the literature" but this isn't really justification. Also, please debunk what Gherardi said about FLBs and Al-Rho. Al-Rho and FLBs causes macrophage response like an adjuvant-antigen complex. Adjuvant alone does not. While he didn't use the word infants, he mentioned immature blood brain barrier. I guess the misunderstanding is you're going by what he says and I'm going by mostly what the data suggests and what he implies. I do admit he never stated this explicitly but I'm implying based on the data and I'm going by something else I read about him speaking at a conference or perhaps from his 2015 paper. I don't remember, but he did mention fetuses and infants somewhere as well as the elderly saying that as one grows older CCL2 expression increases. That was actually mentioned in the 2013 paper if memory serves me right. But anyways, I don't think it's good to put much weight on what an author says or what they don't say. Just because Gherardi didn't mention anything of "clinical importance" doesn't mean that in the future or even in the present there are other papers that can supplement it and give it clinical relevance. Just because Priest or Flarend or other authors said vaccine adjuvants are eliminated doesn't mean they are as they didn't use antigens. The data should be given way more weight than the authors' interpretation of the data. Just because they say so doesn't mean it's true; they still need the evidence to back it up. It's still not comparable because you are trying to liken Gherardi's study which gave a bolus overdose to mice with genetically-defective BBB to infants receiving Al-containing vaccines administered 2-12 months apart and who do not have leaky BBB. What do you think "far more contributory" means? To help you out it means that works like Priest et al. and Flarend et al. have given us a better understanding of Al toxicokinetics than Gherardi et al. And I will characterise his work as I see fit. His is "paid-for" science and that disgusts me. Sorry Derrick but currently used Al adjuvants are microparticles. "They behaved like antigens" is not a justification since you well know that different Al species and complexes will have different kinetics. That is one reason why this study has such poor external validity and you simply can't keep comparing it to situations that lack the same parameters. You are asking me to compare apples to oranges with telling me to "justify" Al complexes with Al adjuvants alone. By the same token you can't state that Gherardi made an apt comparison without using comparable antigen-adjuvant comlexes which he could have easily done. We are here to discuss whether or not aluminum can enter the brain of infants or fetuses. The discussion is not just limited to what Gherardi said. Gherardi was something I brought up for this topic. The topic is whether or not aluminum can be dangerous. The topic is not about what Gherardi said and what he didn't say. Why can't I invoke something that is relevant? And you keep dodging my points about maternal immune activation without addressing them. You're trying to play a semantics game to back down from what you said. By comparing infant BBB to genetically-altered mice with a leaky BBB is indeed inferring that infants have a leaky BBB. They don't, their BBBs are actually quite intact contrary to what some seem to believe. So again, the use of this particular strain of mice is only applicable to this strain of mice for the most part. Anyways, I want to focus on the Priest and Flarend papers. I want to repeat this to emphasize so we don't go off track on technicalities and trivial arguments too much. Why are they relevant if there is no immune activation? But there is immune activation with just adjuvants. In the review I gave you this is discussed and even cites an earlier work by Gherardi that isn't completely tosh. Science Mom: "It's still not comparable because you are trying to liken Gherardi's study which gave a bolus overdose to mice with genetically-defective BBB to infants receiving Al-containing vaccines administered 2-12 months apart and who do not have leaky BBB." I have only glanced at this, but noticed a familiar name being mentioned on another blog on the same subject: Another “Frontiers In” journal steps in it. In it Dr. Smith says: "Others have already posted stinging critiques of Shaw and Tomljenovic’s previous papers (even the World Health Organization has criticized them), so I won’t go further into the science–suffice it to say, Shaw & Tomljenovic are cited widely within the review, and several other important citations are self-citations of the first author, Gherardi. It should be noted that Gherardi also receives funding from the Dwoskin Foundation." Yeah, I did kind of get those mixed up. I just realized that. So, if I did the math correctly, to get the equivalent to of the 200mg per day from Vaccines, you'd have to get 235 shots of the Pediarix (DTaP, Hep B and Polio combo vaccine) every day for weeks or even months before it even has an effect on you? Considering that this is highly unlikely, it sounds to me like the Anti-Vaccine movement is hyping up Aluminum to be more than it is? They don't really appear to have very reliable sources. There is a difference between ingestion, intramuscular injection and intravascular injection. Read my comments above. I'm still waiting for a reply to my latest comment. Right, the ingestion only gives you about 1% of it total. However, a person of my weight, would have to get 32,900 shots of the highest concentration of Aluminum every day for weeks or months before it would finally kill me. That's assuming my calculations are correct with a male lab rat weighing 500g, it takes 140 male lab rats to equal my weight, and it takes 235 shots to equal the 200mg of Aluminum per day. I think people overplay the Aluminum a bit too much maybe? Most people who argue against aluminum are worried about autism, other neurological disorders, or other complications. Not really death. But if Aluminum from the Vaccine is in such a small amount and stays in one place, then how can it possibly cause Autism? I too feared that this could be a possibility, but I know better now. First, I'm not sure where you got 200 mg from; are you extrapolating some data? Second, I pointed out that minimal risk levels in the Mitkus and Keith studies did not take into consideration intramuscular injection. If they did, the 200 mg or whatever number it should be, would be lower since aluminum is retained in the body rather than eliminated through kidneys. It's too complicated to explain how scientists come up with these risk levels for various diseases. Now, I'm not intending to imply anything about autism, but I want to point out that in general, there are many toxins that can cause permanent damage in "low levels". You asked how aluminum can cause damage if it stays in one place. My question is, how will it not? Aluminum isn't inert to biological processes. Don't we want it NOT to stay in one place? Don't we want it to get eliminated through the kidneys? Ideally yes, it would be better if the Aluminum is gotten rid of. The problem though is that it takes about the same time to get rid of the Aluminum that is running all throughout the body isn't it? Don't get me wrong, I believe they could do a better job with less invasive adjuvants, I really do. I just think that people are going way over board with such a tiny minuscule amount of Aluminum. I'm not sure what you mean by the first paragraph. But my main arguments are that aluminum persists in the body and builds up, it does not stay inert in one spot even in insoluble form, even if it leaves it body it causes damage first then leaves. I could be wrong but I want to hear what Todd says and finish my discussion with him first. I don't want to elaborate here because the comment above with Todd is similar and if we continued, it would be repetitive. I will get back to you after I clear things up with Todd. Nobody but Gherardi's group and within France it seems can replicate his results re: MMF. Aluminium does bioaccumulate but there is still turnover and tissue deposition puts the brain last. The vast majority of aluminium is excreted within the first 24 hours no matter what the route. He did not use IM injection. See me discussion with Todd above. He used IV data to ASSUME the IM model which I am disputing in the above discussion with Todd. Derrick, Mikas (sorry not Keith) et al. adjusted for efflux at the injection site of an IM injection based upon Priest's previous IV work. The resulting kinetics reflect what happens with an IM injection. Can you be more specific with what you mean by adjust? My question is how did he use IV data to calculate IM dynamics? I think in adjusting, he assumed aluminum adjuvants behaved the same as aluminum citrate used in IV and didn't account for macrophages as he assumed the aluminum remained localized. I cited the Gherardi study to dispute the localization and the Krewski to dispute the aluminum citrate assumption. Feel free to join my discussion with Todd above. I will respond to him after he gives feedback on Gherardi as well. Can you be more specific with what you mean by adjust? My question is how did he use IV data to calculate IM dynamics? I think in adjusting, he assumed aluminum adjuvants behaved the same as aluminum citrate used in IV and didn't account for macrophages as he assumed the aluminum remained localized. Sure, if you read Mitkus et al. 2011 starting from section 2.3 (methods) into the results section you will see they made numerical adjustments for infants receiving Al adjuvants based upon glomeral filtration rate, IM administration (effusion from the injection site) and aluminium type. I cited the Gherardi study to dispute the localization and the Krewski to dispute the aluminum citrate assumption. Feel free to join my discussion with Todd above. I will respond to him after he gives feedback on Gherardi as well. Gherardi's work is not generalisable to any population other than certain genetically-modified mice but I'll let Todd kick that ball. Flarend's work (which is far more relevant to infant Al adjuvant exposure) is also incorporated into Mitkus' calculations. Yes and I am claiming that the numerical adjustments are based off assumptions. With antigens bound, the size of the aluminum particle is much larger than that of aluminum hydroxide or aluminum phosphate. Why is Flarend more relevant? The adjuvants didn't do ligand exchange and bind to antigens nor was there any immune activation analogous to vaccines. With macrophages due to immune response, the aluminum particles will be taken up and transported due to the macrophage chemo attractant protein 1 (MCP1 or CCL2) before it gets dissociated and filtered by kidneys. Flared didn't account for this with the 28 day rabbit experiments. Todd doesn't seem to be responding so please comment on my post above if you think there is an error. Sorry, Derrick. I've been a bit busy and want to give the Gherardi study a good read. It's a pretty technical paper. Bear with me. If I did the math right, the maximum possible a child would get is 1.725mg in one day (at the 15 month point). That is below the minimal risk level for underweight infants. WARNING: This product contains aluminum that may be toxic. Aluminum may reach toxic levels with prolonged parenteral administration if kidney function is impaired. Premature neonates are particularly at risk because their kidneys are immature, and they required large amounts of calcium and phosphate solutions, which contain aluminum. So 0.004-0.005 mg/kg/day limit for premature or kidney impaired. That's like a max of 0.015 mg for a 3 kg premature baby. This is significantly lower than 0.85 mg. Do you have any info on the limits for 3.4 kg baby at birth, 5 kg at 2 months, etc.? You should bear in mind that the regulation you're quoting is for large volume parenteral nutrition products. These are given intravenously (not intramuscularly) a couple times a day, usually for 10 or more days. In other words, it's for chronic, intravenous exposure, not acute, intramuscular exposure. Daily, intravenous administration has a greater risk of the aluminum accumulating to dangerous levels. Though it also bears mentioning that the exposure limits also have a built-in buffer of around 10-100 fold to ensure that exposure is well below levels that cause problems. Try this: get a in IV saline bag, and then hold it next to a vaccine syringe. Do you notice a difference in volume? Now ask yourself if you would consider the contents of a twenty pound bag of salt to the teaspoon you put in a recipe as equivalent. I do use up to two cups of salt in a fabric dye bath, but only about a teaspoon when cooking. I know there is a difference, especially since I never put any food in a container that I have used for dyeing fabric. The question is: do you know the difference? Thanks. My other question was about the appropriate doses of Al per body weight? is it safe to assume that 0.85 mg is safe for a 10 kg person as for a 3 kg person? Any references on this would be good. There are lots of links to that kind of information in the above article. Try clicking on the words in blue font. By the way, aluminum is the most common metal element on this planet's crust. It is in the minerals (feldspar) that make up soil, soil that is used to grow food crops. The most common way for humans to consume aluminum is by eating food (hence the limits on IV nutrition). One of the many references linked above is the Agency for Toxic Substances and Disease Registry (ATSDR). Click here for an easy to read summary. Here is one sentence in that summary: "An average adult in the United States eats about 7–9 mg of aluminum per day in their food." How does that compare on the total number of DTaP vaccines a child is given in their lifetime? How does that compare to a child getting pertussis? which seems to contradict the referenced study above. There is increasing evidence, instead, that AlO(OH) moieties cluster into nanoparticles aggregates and are trapped by macrophages which are then redistributed and persist in the body. This recent paper in Nature shows (microscopic images) of Al adjuvant nanoparticles inside cells post vaccinations: http://www.nature.com/articles/srep06287 . The kinetics of these species seems far more complex than what we think, and we're far from understanding its mechanisms. So you never scraped your knee in the dirt nor got cut by an aluminum chain link fence as a kid? And we are not petri dishes. So what is the relative risk of harm from pertussis to a non-petri dish human child versus the amount of adjuvants in the full DTaP series? "assume that the fate of ingested Al and injected Al adjuvant is the same:"
People who compare IV nutrition fluids for premature neonates and those with impaired kidneys with vaccines that are given months apart to healthy growing babies and children should not make that comment. So guys vaccines are safe? Should I use traditional vaccination schedule for my son? Yes, the most important graph on this page is the one that shows that aluminum is not used in standard vaccines. So regardless of your opinions about the long scientific discussion in the comments, this page shows that your child's vaccine schedule is safe. I'm guessing Avery is being facetious. They are likely safe, but there is a small amount of aluminum in nearly all standard vaccines. I'm guessing Avery is being facetious. There is a small amount of aluminum in most standard vaccines. Vaccines are likely safe, but there is risk with any medical intervention. It is all about whether, for your child, the benefit outweighs the potential risk. your own source for HPV says .5mg rather than the .225 you listed, fyi. Thank you for pointing that out. At the time that I wrote this post in 2015, the source included the table that I copied above, listing HPV vaccine as having .225mg/dose (source: https://web.archive.org/web/20150207072840/http://vec.chop.edu/service/vaccine-education-center/vaccine-safety/vaccine-ingredients/aluminum.html). I've updated the post to reflect the added information. Is the Government Taking Away People's Beliefs?